The VERY talented and VERY amazing Sabrina has done another piece of V-Scope fan art. I don’t know if I should feel jealous that V-Scope is obviously her favorite Team Stryker member when Casanova is (loosely) based on me. At least it results in some great hand drawn art. 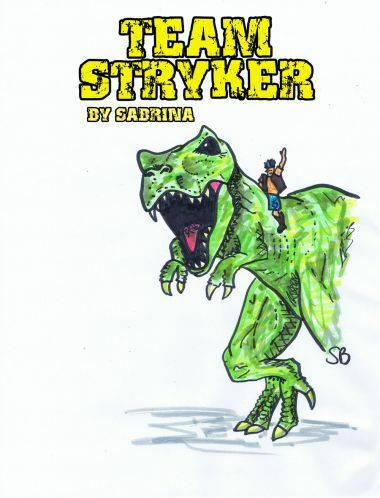 V-Scope riding the t-rex on the front cover of Mission 003 has been one of my favorite things to draw so far and I loved seeing Sabrina’s interpretation of it. Next week we’ll be back to the Sad Magician action. Until then feel free to follow me and Team Stryker on Facebook and Twitter.